An illustration of so-called "mob football", a variety of medieval football. Medieval football is a modern term sometimes used for a wide variety of localised football games which were invented and played in Europe during the Middle Ages. Alternative names include folk football, mob football and Shrovetide football. These games may be regarded as the ancestors of modern codes of football, and by comparison with later forms of football, the medieval matches were chaotic and had few rules. The Middle Ages saw a huge rise in popularity of games played annually at Shrovetide throughout Europe, particularly in England. The games played in England at this time may have arrived with the Roman occupation but there is little evidence to indicate this. Certainly the Romans played ball games, in particular Harpastum. There is also one reference to ball games being played in southern Britain prior to the Norman Conquest. In the ninth century Nennius's Historia Britonum tells that a group of boys were playing at ball (pilae ludus). The origin of this account is either Southern England or Wales. References to a ball game played in northern France known as La Soule or Choule, in which the ball was propelled by hands, feet, and sticks, date from the 12th century. 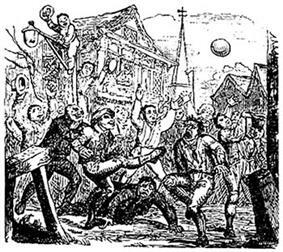 These archaic forms of football, typically classified as mob football, would be played between neighbouring towns and villages, involving an unlimited number of players on opposing teams, who would clash in a heaving mass of people struggling to drag an inflated pig's bladder by any means possible to markers at each end of a town. By some accounts, in some such events any means could be used to move the ball towards the goal, as long as it did not lead to manslaughter or murder. Sometimes instead of markers, the teams would attempt to kick the bladder into the balcony of the opponents' church. A legend that these games in England evolved from a more ancient and bloody ritual of kicking the "Dane's head" is unlikely to be true. These antiquated games went into sharp decline in the 19th century when the Highway Act 1835 was passed banning the playing of football on public highways. Antithetical to social change this anachronism of football continued to be played in some parts of the United Kingdom. These games still survive in a number of towns notably the Ba game played at Christmas and New Year at Kirkwall in the Orkney Islands Scotland, Uppies and Downies over Easter at Workington in Cumbria and the Royal Shrovetide Football Match on Shrove Tuesday and Ash Wednesday at Ashbourne in Derbyshire, England. Few images of medieval football survive. One engraving from the early fourteenth century at Gloucester Cathedral, England, clearly shows two young men running vigorously towards each other with a ball in mid-air between them. There is a hint that the players may be using their hands to strike the ball. A second medieval image in the British Museum, London clearly shows a group of men with a large ball on the ground. The ball clearly has a seam where leather has been sewn together. It is unclear exactly what is happening in this set of three images, although the last image appears to show a man with a broken arm. It is likely that this image highlights the dangers of some medieval football games. The earliest account of ball games being played in Europe (after the Roman occupation) comes from the 9th-century Historia Brittonum, attributed to Nennius. The text, composed in what is now northern Wales, mentions a group of boys "playing at ball" (pilae ludus). The earliest confirmation that such ball games in England involved kicking comes from a verse about Little Saint Hugh of Lincoln. This was probably written in the thirteenth century, being recorded by Matthew Paris, although the precise date is not known: "Four and twenty bonny boys, were playing at the ball.. he kicked the ball with his right foot". In about 1200 "ball" is mentioned as one of the games played by King Arthur's knights in "Brut", written by Layamon, an English poet from Worcestershire. This is the earliest reference to the English language "ball". Layamon states: "some drive balls (balles) far over the fields". Records from 1280 report on a game at Ulgham, near Ashington in Northumberland, in which a player was killed as a result of running against an opposing player's dagger. This account is noteworthy because it is the earliest reference to an English ball game that definitely involved kicking; this suggests that kicking was involved in even earlier ball games in England. In Cornwall in 1283 plea rolls No. 111. mention a man named Roger who was accused of striking a fellow player in a game of soule with a stone, a blow which proved fatal. The earliest reference to ball games being played by university students comes in 1303 when "Thomas of Salisbury, a student of Oxford University, found his brother Adam dead, and it was alleged that he was killed by Irish students, whilst playing the ball in the High Street towards Eastgate". In 1314, comes the earliest reference to a game called football when Nicholas de Farndone, Lord Mayor of the City of London issued a decree on behalf of King Edward II banning football. It was written in the French used by the English upper classes at the time. A translation reads: "[f]orasmuch as there is great noise in the city caused by hustling over large foot balls [rageries de grosses pelotes de pee] in the fields of the public from which many evils might arise which God forbid: we command and forbid on behalf of the king, on pain of imprisonment, such game to be used in the city in the future." Another early account of kicking ball games from England comes in a 1321 dispensation, granted by Pope John XXII to William de Spalding of Shouldham: "To William de Spalding, canon of Scoldham of the order of Sempringham. During the game at ball as he kicked the ball, a lay friend of his, also called William, ran against him and wounded himself on a sheathed knife carried by the canon, so severely that he died within six days. Dispensation is granted, as no blame is attached to William de Spalding, who, feeling deeply the death of his friend, and fearing what might be said by his enemies, has applied to the pope." Banning of ball games began in France in 1331 by Philippe V, presumably the ball game known as La soule. Youths playing ball depicted on a misericord at Gloucester Cathedral. 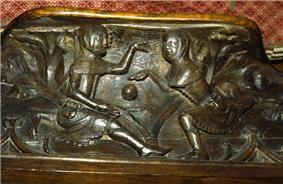 In the mid-fourteenth century a misericord at Gloucester cathedral, England shows two young men playing a ball game. It looks as though they are using their hands for the game; however, kicking certainly cannot be excluded. It is notable for the fact that most other medieval images of ball games in England show large balls. This picture clearly shows that small balls were also used. Likewise Geoffrey Chaucer offered an allusion to the manner in which contemporary ball games may have been played in fourteenth-century England. In the Canterbury Tales (written some time after 1380) he uses the following line: "rolleth under foot as doth a ball". English Theologian John Wycliffe (1320–1384) referred to football in one of his sermons: "the latter clout their shoes with censures as if they were playing football" Some of Wycliffe's works were published in English and it is not clear which language this particular reference to football was written in. It may therefore be the earliest use of the word football in English. That football was known at the turn of the century in Western England comes from about 1400 when the West Midland Laud Troy War Book states in English: "Hedes reled aboute overal As men playe at the fote-ball"
King Henry IV of England provides the first documented use of the English word "football" when in 1409 he issued a proclamation forbidding the levying of money for "foteball". In 1409 on 4 March eight men were compelled to give a bond of £20 to the London city chamberlain for their good behaviour towards "the kind and good men of the mystery of Cordwainers" undertaking not to collect money for a football (pro pila pedali). In 1410 King Henry IV of England found it necessary to impose a fine of 20S on mayors and bailiffs in towns where misdemeanours such as football occurred. This confirms that football was not confined to London. The Accounts of the Brewers company of London between 1421 and 1423 concerning the hiring out of their hall include reference to "by the "ffooteballepleyers" twice... 20 pence" listed in English under the title "crafts and fraternities". This reference suggests that bans against football were unsuccessful and the listing of football players as a "fraternity" is the earliest allusion to what might be considered a football club. The earliest reference to football or kicking ball games in Scotland was in 1424 when King James I of Scotland also attempted to ban the playing of "fute-ball". In 1425 the prior of Bicester, England, made a payment on St Katherine's day "to sundry gifts to football players (ludentibus ad pilam pedalem)" of 4 denarii. It is noteworthy that at this time the prior was willing to give his patronage to the game despite its being outlawed. In about 1430 Thomas Lydgate refers to the form of football played in East Anglia known as Camp Ball: "Bolseryd out of length and bread, lyck a large campynge balle"
In 1472 the rector of Swaffham, Norfolk bequeathed a field adjoining the church yard for use as a "camping-close" or "camping-pightel" specifically for the playing of the East Anglian version of football known as Camp Ball. In 1486 comes the earliest description of "a football", in the sense of a ball rather than a game. This reference is in Dame Juliana Berners' Book of St Albans. It states: "a certain rounde instrument to play with ...it is an instrument for the foote and then it is calde in Latyn 'pila pedalis', a fotebal." It is noteworthy that it was considered socially acceptable for a football to be included in medieval English Heraldry. There is an account from 11 April 1497 of a sum of money "giffen [given] to Jame Dog [James Doig] to b[u]y fut ballis to the King".. It is not known if he himself played with them. The earliest and perhaps most important description of a football game comes from the end of the 15th century in a Latin account of a football game with features of modern soccer. It was played at Cawston, Nottinghamshire, England. It is included in a manuscript collection of the miracles of King Henry VI of England. Although the precise date is uncertain it certainly comes from between 1481 and 1500. This is the first account of an exclusively "kicking game" and the first description of dribbling: "[t]he game at which they had met for common recreation is called by some the foot-ball game. It is one in which young men, in country sport, propel a huge ball not by throwing it into the air but by striking it and rolling it along the ground, and that not with their hands but with their feet... kicking in opposite directions" The chronicler gives the earliest reference to a football field, stating that: "[t]he boundaries have been marked and the game had started. Nevertheless the game was still rough, as the account confirms: "a game, I say, abominable enough . . . and rarely ending but with some loss, accident, or disadvantage of the players themselves." Medieval sport had no referee. They get the bladder and blowe it great and thin, with many beanes and peason put within, It ratleth, shineth and soundeth clere and fayre, While it is throwen and caste up in the eyre, Eche one contendeth and hath a great delite, with foote and hande the bladder for to smite, if it fall to the ground they lifte it up again... Overcometh the winter with driving the foote-ball. The first record of a pair of football boots occurs when Henry VIII of England ordered a pair from the Great Wardrobe in 1526. The royal shopping list for footwear states: "45 velvet pairs and 1 leather pair for football". Unfortunately these are no longer in existence. It is not known for certain whether the king himself played the game, but if so this is noteworthy as his son Edward VI later banned the game in 1548 it because it incited riots. Some men wolde say, that in mediocritie, whiche I haue so moche praised in shootynge, why shulde nat boulynge, claisshe, pynnes, and koytyng be as moche commended? Verily as for two the laste, be to be utterly abiected of al noble men, in like wise foote balle, wherin is nothinge but beastly furie and extreme violence; wherof procedeth hurte, and consequently rancour and malice do remaine with them that be wounded; wherfore it is to be put in perpetuall silence. In class she is emploied to litle strength; in boulyng oftentimes to moche; wherby the sinewes be to moche strayned, and the vaines to moche chafed. Wherof often tymes is sene to ensue ache, or the decreas of strength or agilitie in the armes: where, in shotyng, if the shooter use the strength of his bowe within his owne tiller, he shal neuer be therwith grieued or made more feble. Although many sixteenth-century references to football are disapproving or dwell upon their dangers there are two notable departures from this view. First, Sir Thomas Elyot (although previously a critic of the game) advocates "footeball" as part of what he calls vehement exercise in his Castell of Helth published in 1534. Secondly English headmaster Richard Mulcaster provides in his 1581 publication the earliest evidence of organised, refereed football for small teams playing in formation. The oldest surviving ball that might have been used for football games dates to about 1540 and comes from Scotland. It is made from leather and a pig's bladder. It was discovered in 1981 in the roof structure of the Queen's Chamber, Stirling Castle. Whilst other uses for the ball, such as pallone, have been suggested, most notably by the National Museum of Scotland, due to its size (diameter 14–16 cm), staff at the Stirling Smith Museum and researchers at the Scottish Football Museum have attributed its use to football, citing the description of the ball used in the Carlisle Castle game of 1568. The earliest specific reference to football (pila pedalis) at a university comes in 1555 when it was outlawed at St John's College, Oxford. Similar decrees followed shortly after at other Oxford Colleges and at Cambridge University. Another reference occurred in 1555, when Antonio Scaino published his treatise Del Giuoco della Palla (On the Game of the Ball). 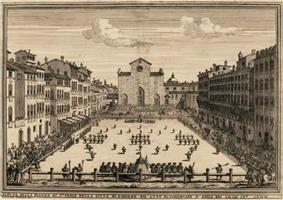 It was mostly concerned with a medieval predecessor of tennis, but near the end, Scaino included a chapter titled, "Del Giuoco del Calcio" ("On the Game of Football"), for comparison. According to Scaino, the game was popular with students. It could be played with any number of players. The only rules seem to be that weapons could not be brought onto the field, and the ball could not be thrown by hand. The goal was for each team to try to cross the ball across a marked space at the opposite end of the field. To start, the ball was placed in the middle of the field and kicked by a member of the team that was chosen by lots. Scaino remarks that its chief entertainment for the spectators was to see "the players fall in great disarray & upside down." In 1568 Sir Francis Knollys described a football game played at Carlisle Castle, Cumbria, England by the retinue of Mary Queen of Scots: `20 of her retinue played at football before her for two hours very strongly, nimbly, and skilfully". According to contemporary sources and detailed publications Mary's retinue was predominantly Scottish, made up primarily by nobles who had followed her south in the aftermath of the Battle of Langside. The first official rules of Calcio Fiorentino (Florentine kick) were recorded in 1580, although the game had been developing around Florence for some time before that date. The game involved teams of 27 kicking and carrying a ball in a giant sandpit set up in the Piazza Santa Croce in the centre of Florence, both teams aiming for their designated point on the perimeter of the sandpit. In 1586, men from a ship commanded by English explorer John Davis, went ashore to play a form of football with Inuit (Eskimo) people in Greenland. "This game... is thought to be of great antiquity and is as followeth. The ancient Britons being naturally a warlike nation did no doubt for the exercise of their youth in time of peace and to avoid idleness devise games of activity where each man might show his natural prowess and agility...... About one or two of the clock afternoon begins the play, in this sort, after a cry made both parties draw to into some plain, all first stripped bare saving a light pair of breeches, bare-headed, bare-bodied, bare legs and feet....The foot company thus meeting, there is a round ball prepared of a reasonable quantity so as a man may hold it in his hand and no more, this ball is of some massy wood as box, yew, crab or holly tree and should be boiled in tallow for m make it slippery and hard to hold. This ball is called cnapan and is by one of the company hurling bolt upright into the air, and at the fall he that catches it hurls it towards the country he plays for, for goal or appointed place there is none neither needs any, for the play is not given over until the cnapan be so far carried that there is no hope to return it back that night, for the carrying of it a mile or two miles from the first place is no losing of the honour so it be still followed by the company and the play still maintained, it is oftentimes seen the chase to follow two miles and more..."
The earliest account of a ball game that involves passing of the ball comes from Richard Carew's 1602 account of Cornish Hurling which states "Then must he cast the ball (named Dealing) to some one of his fellowes". Carew also offers the earliest description of a goal (they pitch two bushes in the ground, some eight or ten foote asunder; and directly against them, ten or twelue score off, other twayne in like distance, which they terme their Goales") and of goal keepers ("There is assigned for their gard, a couple of their best stopping Hurlers"). The first direct reference to scoring a goal is in John Day's play The Blind Beggar of Bethnal Green (performed circa 1600; published 1659): "I'll play a gole at camp-ball" (an extremely violent variety of football, which was popular in East Anglia). Similarly in a poem in 1613, Michael Drayton refers to "when the Ball to throw, And drive it to the Gole, in squadrons forth they goe". In 1615 James I of England visited Wiltshire and the villagers "entertained his Majesty with a foot-ball match"
Oliver Cromwell who left Cambridge University in 1617 was described by James Heath as "one of the chief matchmakers and players of football" during his time at the university. In 1623 Edmund Waller refers in one of his poems to "football" and alludes to teamwork and passing the ball: "They ply their feet, and still the restless ball, Toss'd to and fro, is urged by them all". In 1650 Richard Baxer gives an interesting description of football in his book Everlasting Rest: "Alas, that I must stand by and see the Church, and Cause of Christ, like a Football in the midst of a crowd of Boys, tost about in contention from one to another.... and may drive it before him. ... But to be spurned about in the dirt, till they have driven it on to the goal of their private interests". This is noteworthy as it confirms that passing of the ball from one player to another was part of football games. The first study of football as part of early sports is given in Francis Willughby's Book of Sports , written in about 1660. This account is particularly noteworthy as he refers to football by its correct name in English and is the first to describe the following: modern goals and a pitch ("a close that has a gate at either end. The gates are called Goals"), tactics ("leaving some of their best players to guard the goal"), scoring ("they that can strike the ball through their opponents' goal first win") and the way teams were selected ("the players being equally divided according to their strength and nimbleness"). He is the first to describe a law of football: "They often break one another's shins when two meet and strike both together against the ball, and therefore there is a law that they must not strike higher than the ball". His account of the ball itself is also very informative: "They blow a strong bladder and tie the neck of it as fast as they can, and then put it into the skin of a bull's cod and sew it fast in". He adds: "The harder the ball is blown, the better it flies. They used to put quicksilver into it sometimes to keep it from lying still". His book includes the first (basic) diagram illustrating a football pitch. Alnwick in Northumberland: the Scoring the Hales game survives and begins with the Duke of Northumberland dropping a ball from the battlements of Alnwick Castle. Haxey in Lincolnshire (the Haxey Hood, actually played on Epiphany). In 1752 the Julian calendar was changed for the Gregorian calendar. To achieve this the days between 2 and 14 September were omitted that year. In some villages people thought it was not possible to remove 11 days from a year so refused to accept the new calendar. As a result, Christmas Day was celebrated on 5 January in those villages. The Haxey Hood is played the following day on what would have been the feast of Stephan or Boxing Day if 11 days had not been removed from the calendar. Hurling the Silver Ball takes place at St Columb Major in Cornwall: A "Town against Country" match takes place on Shrove Tuesday and a return match is played the following Saturday. Another version of Cornish Hurling takes place at St Ives this game used to involve men who lived at the top of town against those at the bottom end. Nowadays it is a much gentler version for children only. This version takes place on Feast Monday, normally February. Bottle-kicking, Hallaton, Leicestershire. A game played on Easter Monday which shares common elements with medieval ball games played during celebrations marked by the Christian calendar. Sedgefield Ball Game played in County Durham on Shrove Tuesday. Workington in Cumbria holds three Uppies and Downies matches over the Easter period. There are no rules, except those suggested by cunning and skill, while brute force is of the greatest importance. The goals are about a mile apart. The Uppies attempt to hail the ball at the gates of Workington Hall while the Downies hail at the capstan at the harbour side. Hobkirk, Scottish borders. Handba' game played the Monday before or after Shrove Tuesday. Georgian game similar to rugby. Marn grook, an Australian Aboriginal ball game. Boxball, A game played in Canada where teams may use their hands or feet to play the ball. It is only ever played on a snow covered pitch so as to prevent injuries, and players attempt to score by getting the ball into boxes placed at either end of the pitch. East Anglia: Camp ball was a popular sport in the 15th century. Carved Stone Balls found at various sites in Scotland, northern England and north eastern Ireland. Spirals and rings of concentric circles carved on the balls can be found on standing stones and megalithic structures of the same period. Sites such as Maughanby Circle and Newgrange were designed to monitor the movements of the sun with special emphasis on the winter solstice. The connection with megalithic art infers these carved stone balls had significant cultural importance to the pre-Celtic people who made them. They thought in a symbolic way and displayed ceremonial behaviour we may look upon today as religious. No written records exist for the Neolithic people of Britain and Ireland. From reading the archaeology it has not been is possible to determine whether these peoples understood the concept of a ball game. However, as playing ball games feature in later religious festivities including Christmastide which coincides with Yuletide, the winter solstice and the Pagan rebirth of the sun the possibility cannot be ruled out. ^ a b c d e f g Magoun, Francis Peabody (1929). "Football in Medieval England and Middle-English literature." The American Historical Review, vol 35, No. 1. ^ Ruff, Julius (2001). Violence in Early Modern Europe 1500–1800. Cambridge University Press. p. 170. ^ "History of Football - Britain, the home of Football". FIFA. Retrieved 29 July 2013. ^ Spooner, Andrew (22 January 2006). "Take Me Out To The Ball Game". The Independent. Retrieved 29 July 2013. ^ "The history of Royal Ashbourne Shrovetide Football". BBC. 24 December 2009. Retrieved 29 July 2013. ^ Historia Brittonum, ch. 41. ^ Medieval Cornwall by L. E. Elliot-Binns. ^ Olmert, Michael (1996). Milton's Teeth and Ovid's Umbrella: Curiouser & Curiouser Adventures in History, p.85. Simon & Schuster, New York. ISBN 0-684-80164-7. ^ Inglis Simon; A Load of Old Balls, English Heritage, 2005, P20. ^ Scaino, Antonio. Trattato del Giuoco della Palla. Trans. P. A. Negretti. London: Raquetier Productions Ltd., 1984. ^ Letter written by Sir Francis Knollys to Secretary Cecil, on 2 June 1568, and published in Anderson, James; Collections Relating to the History of Mary Queen of Scotland, Vol IV, Part I. London, 1728. Pp62-63. ^ Keith, Rev Robert; History of the affairs of church and state in Scotland from the beginning of the reformation to the year 1568, Vol 2, Edinburgh, 1844. P827. ^ Halpern, J. Balls and Blood, Sports Illustrated. Vol 109, No. 4: August 4, 2008, p. 42.